This phrase is a popular handle for Christians on Twitter. It seems we may even be obsessed with the fact we can sin. It’s our way of being humble and making Jesus look good. Is this what the Bible intended for us to focus on? 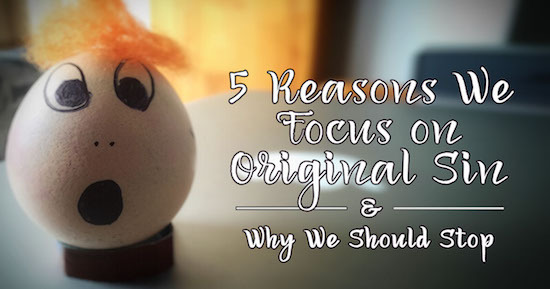 Here are 5 reasons Christians focus on original sin and why we need to stop. 1. We Like Focusing On Sin. I hate to say this, but Christians like to focus on sin. We like to point out where others are wrong and how they need Jesus. It gives us something to pray about – “these people really need help.” It makes us feel better about our decision to follow Jesus. But don’t think we are cocky, we are sinners too… just saved by the grace of God. Sin is easy to focus on because it lays out rules on how to live. Rules create security as we know what is expected and know how to please. However, God wants to give us freedom. We are capable of sin but that should not be our focus and being free of sin shouldn’t be our motivation (1 Corinthians 10:23). 2. It Is Easier to Believe We Are Sinful. Read that line again. Yes, it is easier to believe we are sinful. Because when we see mistakes in ourselves or others, we have a built in excuse. It is harder to understand how we are free from sin yet still sin (Acts 13:39). However, this is what we are called to believe. We are free from sin. Instead of expecting sin, we need to assume we will choose to do what is right. We were created to do good works (Ephesians 2:10). That is are destiny. That is who we are. 3. We Are Afraid of Not Needing Jesus. For centuries every gospel presentation started with our sin to get us to realize our need of a savior. We continue to focus on our sinfulness because we conclude that if we become too good we will not need Jesus. Do we only need Jesus because we are sinful? Tonight I gave my daughter the assignment to find out what “poor in spirit” meant. We searched the Internet for possible answers and every one we found said it meant to realize our sinfulness. Our poverty of spirit or need for God is not dependent on our ability to sin. Angels don’t sin yet still need God. Trees don’t sin, yet they also still need God. Our ability to sin doesn’t enhance our need of God. Being created by God is the only explanation we need to be dependent on Him (Revelation 4:11). 4. We Are Afraid of Our Goodness. Life is easy when you have no expectations on yourself. You can watch television all day, complain about the unfairness in the world, and wish we can hit restart on all the political candidates. You don’t have to take responsibility for anything because you’re just a sinner saved by grace. God knows He put greatness in you and expects you to do greater things than He did (John 14:12). You are intended to make the world a better place, make disciples of nations, and bring heaven to earth. The goodness God placed in you is looking for expression in something of worth. It requires something of you. We are afraid that of our goodness because to admit God has put something of worth in us means we are responsible for letting it out. When someone hurts us, we are to let out forgiveness not anger. We don’t avoid those who are hurting because we have hope for their situation. When the world turns upside down, we have the answer to turn things right again. 5. We Think It’s Biblical. The Bible says that because of Adam’s sin, all the rest of mankind had been marked with sin from conception (Romans 5:12). Theology stresses this in creating the doctrine of original sin. It emphasizes we are born steeped in sin. We are so flawed that we need Jesus. The point is after we accepted Jesus’ offer of salvation we are no longer given that name. While we were yet sinners Christ died for us (Romans 5:8). Before Jesus dies for us we were sinners, but things have now changed. Original sin assumes this is our starting point. While we entered the world with the mark of sin, our starting point goes before that. During creation God made male and female and said they were very good (Genesis 1:27, 31). Sin came afterwards and caused a break in our relationship with God, but our originality is not sin – it is goodness. It is this original goodness in every person that keeps this world a bit sane. Without it their would be no Muslim standing up protecting Christians in the Middle East. Without it environmentalists wouldn’t care about the earth. Without it every non-Christian leader would be a cruel dictator fleecing the people for everything he could get. Can you imagine if the world knew we saw goodness in them? How would they respond to us differently? What if every Christians wanted Jesus because of love instead of fear of falling back into sin? Sin is a real problem, but Jesus gave us a real solution. You were dead in sin, but you are now alive in Christ (Colossians 2:13). He came to set you free, to become all that you were originally created to be. Let’s follow Jesus’ example and set our eyes on what’s ahead. Life was intended to be an amazing adventure. What do you think? Feel free to ‘amen’ a point or offer a rebuttal. I would love to hear your thoughts in the comments below.